I was planning to post this yesterday but when I got it home I decided that I wanted to tweak it just a little. Not too much though! 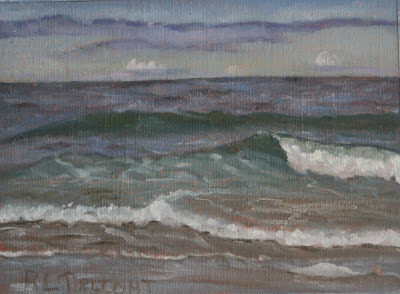 This is a plein air wave study I did yesterday. The day was kind of a strange weather day. It was mizzling (mist/drizzle) on and off and the sun kept popping in to try to burn off the mist only to disappear again. They sky had a kind of pearly look to it and the clouds were outlined in dark violet with rosy interiors. As I was painting on the beach a strange low double rainbow appeared about 25 yards away. I couldn't decide it it was sprinkling or just a heavy mist. Of course, I left my camera at home. In spite of the dampness, it was fairly warm. I shed my rain gear and hat fairly quickly. I had to choose angling my painting umbrella to block the overly bright diffuse sunshine or to keep the wet off. I chose to keep the sunshine off my painting so my palette and painting had water beading up on it. I am starting to get the hang of composing these paintings. I pretty much decide where I want the horizon line, how much water, and how much shore. The choice depends on what is gong on at that moment. 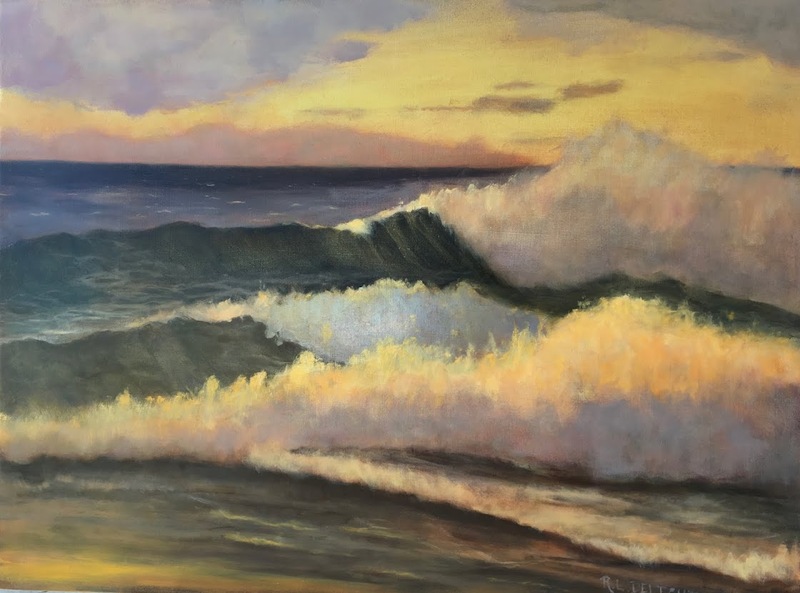 I watch the waves for a time and when I see how they are interacting (it changes hourly) then I pick a wave to start with and build the rest of the painting from there. Doesn't mean that I make a great painting everytime but I am learning how to shape the composition while painting a moving entity from life. Each painting I do points me to where I need to work next. I still have a ways to go but I am seeing improvement. This painting was done on a Raymar Art canvas board. The board is covered with Classen''s #13 Linen. It was part of a sample pack I got to try the different surfaces. I liked this one the least. In fact I really didn't like it at all. I thought the linen too coarsely woven for the kind of surface I wanted. The other samples worked OK. I really like the smooth surface of one. I will probably go with that one eventually. In the meantime I have ordered some hemp yardage which arrived today. I am going to gesso it and use it loose for my plein air studies. When I am satisfied with the quality of my plein air paintings, I will go back to painting on the panels. I want to build up a reference sketch library to paint larger paintings from before I start selling my plein air paintings. It has been a long day and I am having trouble keeping my eyes open. I hope to finish my little marine inspired still life tomorrow but if the day is decent, I will probably go out painting. The weather forecast says we will be having wet and stormy weather for a while starting soon so I need to paint outside while I can!